I didn’t have time to take anything out of the freezer this morning, and I knew we were running pretty low on fresh produce. While at work, I envisioned what I had in the freezer to make for dinner. I basically concocted a combination of several leftover ingredients to come up with a fantastic panini. Of course the chicken and bacon were frozen, so I did have to thaw them out, but I used up to leftover ciabatta rolls, some chipotle mayonnaise, tomatoes, lettuce, onions, and some swiss cheese that I feel like has been in the fridge forever. Paired with a salad, it was a fantastic little dinner. 1. Preheat oven to 375 degrees. Season each side of the chicken breasts with southwest seasoning and rub into chicken. On on a foil lined baking sheet, bake chicken for 25-30 minutes, or until cooked through. Remove from oven and let rest for at least 5 minutes. Slice thin. 2. Preheat panini grill. Spread both sides of rolls or each piece of bread generously with the chipotle mayonnaise. Add greens, onions, and tomatoes to each sandwich. 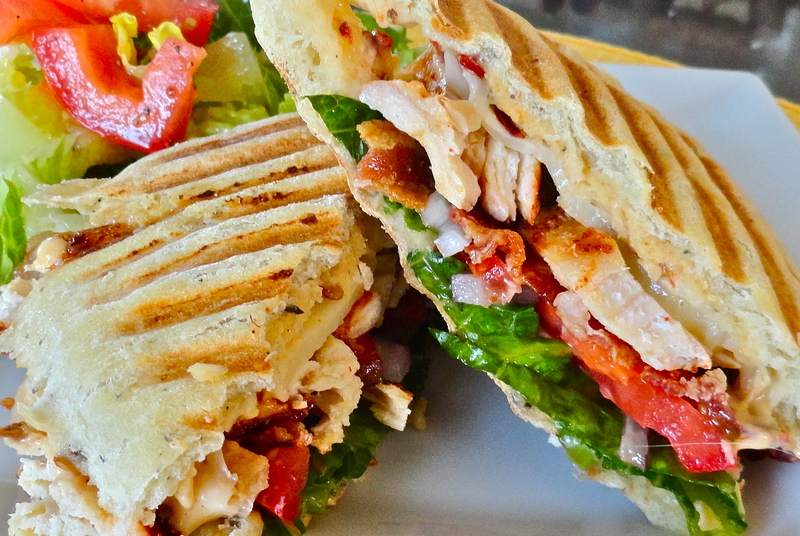 Add sliced chicken, two slices of bacon and one slice of swiss cheese to each sandwich, and top with ciabatta, or second slice of bread, spread with chipotle mayonnaise. 3. Place sandwiches on panini grill and press top down, careful not to let sandwich tops slide off. Cook for about 5 minutes, or until bread begins to turn brown and cheese is melted. Let sandwich rest for 2 minutes, cut in half, then serve. 1. Mix all ingredients together. Store in an air tight container.